You have a writing project that you absolutely have to do - so - let’s make it fun! Where do you start? Pick a topic which interests you. That’s indispensable, otherwise the research and writing will be a chore. If you’re interested in the topic, the work will seem less difficult. Well ... you have to care, because it’s an assignment, so focus on some aspect of the subject matter which you can embrace. There’s always something interesting to uncover, once you start investigating. The key, to investigating, is how to think about your topic so you can find your way through the subject. That’s half the battle. So ... let’s reverse-engineer a story, at AwesomeStories, so you can follow-along its creation path. When, and where, did Hammurabi live? What was the world like at that time? What was his form of writing - how did he express his language in written words? Does anyone still use this writing form? How do people in today’s world know how to read Hammurabi’s words? How do we know about Hammurabi? Is what we know about him reliable? How can you tell whether what we know is reliable? Did his religion have anything to do with his law code? Why did he write his law code? Why is that code still famous? How was Hammurabi’s law code recorded? Where and when did that rediscovery take place? Where is Hammurabi’s Code of Laws located today? Did the law code include punishments? Would we consider the law code’s punishments to be harsh? How would a similar offense, in today’s world, be viewed? What’s happening in Hammurabi’s part of the world today? If he could come back, how do you think Hammurabi would view his country’s laws today? With a list of questions like this in mind, you can begin your story investigation. 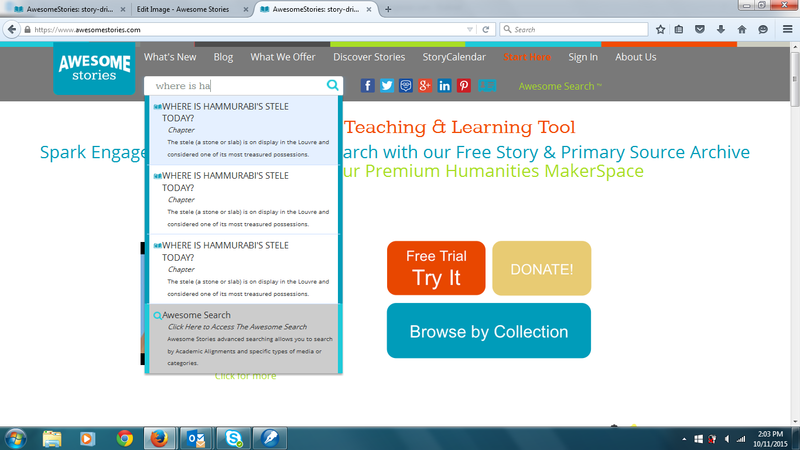 If your topic is part of a story at AwesomeStories, you can do most of your research right there. Use one of our seven ways to search the site to check it out. If your topic is not a featured story at AwesomeStories, you can use one of the worldwide archives, linked at AwesomeStories, to investigate what you need to know about your topic. Continuing with our Hammurabi example ... if you want to investigate all (or many) of the bulleted questions, you could write a multi-chapter story. If you want to explore one (or just a few) of the questions, you could write a shorter story. Why use a story format to write about your topic? Because stories are interesting. People remember what they learn from stories. They are much more willing to read (or listen-to) a topic if it is laid-out in a story format. All of us know how to tell stories. When we talk with our friends, and our families, we don’t just give them a lot of facts. We weave those facts into a story. We make our conversations interesting because we relate what we know in a story format. So ... let’s do the same thing here. Let’s pick a single question, from our list of questions, and investigate it. The question is: Where is Hammurabi’s Code of Laws located today? As it happens, we can find that question (and answer) at AwesomeStories. All we have to do is search for it. Going to the search bar, at the top of the page, we start typing the question. We find there’s an entire chapter which discusses it. After reading that chapter, we learn that Hammurabi’s law code was inscribed on a slab of igneous rock known as “diorite.” The diorite rock, with Hammurabi’s code, is known as Hammurabi’s Stele. Today it is displayed at the Louvre, in Paris. 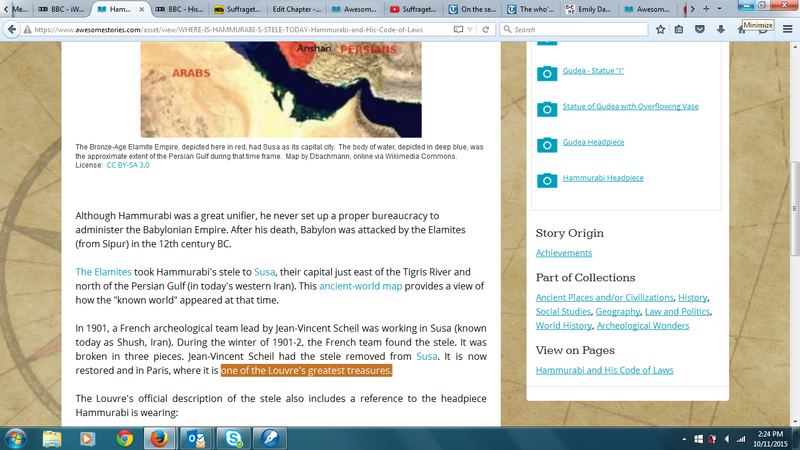 We can “go to the Louvre,” to see the stele, by following a link in the AwesomeStories’ chapter we found in our search. Once we arrive at the Louvre, online, a curator explains the stele and shows us how it had been found (broken into three pieces). She also tells us other compelling facts about this priceless discovery. Suppose you find all of this really interesting and want to write about why Hammurabi’s Law Code is at the Louvre. You now have the research you need to tell that story. Around 3700 years ago, a man called Hammurabi ruled his people in the part of the world we know now as Babylon. Hammurabi wanted the people to have a system of laws, so he wrote them down. Today we can actually see Hammurabi’s Stele at the Louvre, a very famous museum in Paris, France. It makes us wonder, though: Why is Hammurabi’s Stele in Paris when it was found at Susa (known, today, as Shush, Iran)? The Stele was found by a French team, working at Susa during the winter of 1901-1902. The stele was broken in three pieces when the team found it. Thereafter, the team leader had the broken pieces removed from the archaeological site. They were put back together by experts at the Louvre. To help others learn from your story, as you learned from the Awesome Story, you can highlight words to add links. An important link to add, of course, would be the virtual visit to the Louvre. You can also include pictures, videos and animations (like the animation at the Louvre). To make your story “look good” on the page, remember to keep your paragraphs short. You don’t want to intimidate your readers with endlessly long paragraphs! Short paragraphs are like psychological breaks—we all need them. You have now created an interesting story, about an important topic, which still matters today. After all ... did you know that America’s Supreme Court, and the U.S. House of Representatives, both feature an image of Hammurabi, the ancient lawgiver? Bos, Carole "How to Find, Research and Write a Great Story" AwesomeStories.com. Aug 28, 2015. Apr 25, 2019.